First let me say that Blogger is being INSANE. I tried to put these three photos at the END of my post, but it was virtually impossible. So after an hour of trying different methods, I just decided they will stay where they pop up - which is right here. 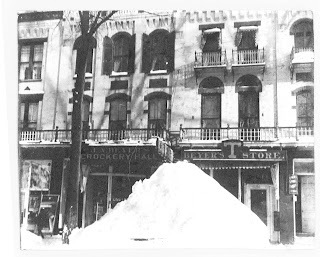 The first photo above is of downtown Saratoga Springs, NY after a BIG snow. The photo under that is of Champlain Canal towpath in Battenkill, NY. There is nothing written on the back, so I don't know the year. 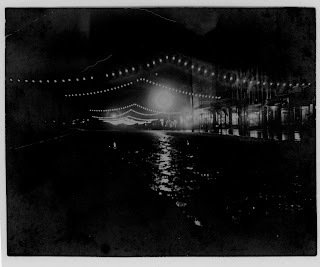 The last photo is of Broadway in Saratoga Springs, NY illuminated for Christmas - no year - but these photos are part of the collection of my grandmother's aunt, so they are probably early 1900's. Check out the ice on Broadway - it looks like a frozen lake instead of a street. I am -and have been in - the process of studying my family genealogy for a few years now. I haven't gotten too far, but I have had lots of fun - and I've found a few things I didn't know in the past. There is a lot more to learn and some puzzles to solve. I want to post scans of lots of old photos I inherited from my father, who inherited them from his mother, who interited a lot of them from her aunt. 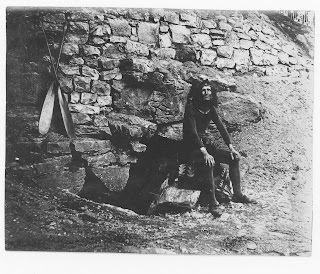 Many of these photos date from the late 1800's and early 1900's and take place in and around the environs of Saratoga Springs, NY. Basically, for now, this is going to be about my father's family. My mother's family is much more difficult to trace since her parents both came from Galicia in Poland at the turn of the century. My father is Richard James Bootier. He was born on March 24, 1919 in Saratoga Springs, NY. His mother was Frances (Fannie) DeWitt and his father was Frederick J. Bootier. I have traced the Dewitts back to the Doolittles and I've traced the Bootiers. We'll start with the Bootiers. Back before the Civil War there were two brothers - Nelson and Ezra Bootier, who lived in southeastern Canada, just over the border from Maine. The family story goes that one of them had a wife and children, but his house burned down with all of them in it, and so, brokenhearted and despondent, he came to the US to fight in the Civil War, hopefully to die. I have my doubts about this story - it sounds like so much romantic nonsense, although tragedies like that DID happen back then. The winters were very cold and houses were made of wood. The problem is that Ezra came to the US in 1846, 15 years before the Civil War began. I, however, am descended directly from Nelson Bootier, so let's see when he arrived in this country. Whether it was Nelson or Ezra, I don't know. But they show up on Civil War records and on census records. Here is Ezra Bootier - he was born around 1838 in Canada and was 82 in 1920. 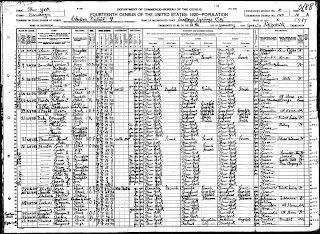 This is a copy of the 1920 Census. 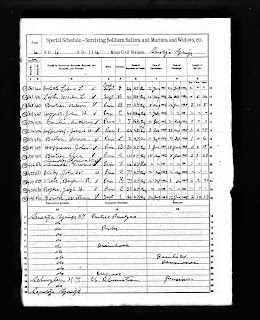 I cannot find census information for Nelson Bootier after 1880. He was listed in the Saratoga Springs directory in 1891-2 as a tinsmith, but after that, nothing. The bottom of the form has injuries of each person by line number. Nelson is line number 15, and - poor Nelson - he had piles. That is the old fashioned name for hemmorhoids. We Bootiers are certainly glamorous. I found another reference on ancestry.com that lists Nelson as entering the country in 1868, which doesn't make sense, since he fought in the Civil War from 1862-1865, as did Ezra. Here is how the family breaks down. Freddie grew up and became Frederick N. Bootier. He married Josephine Brunett of Sandy Hill, NY (which became Hudson Falls, NY) on February 28, 1892. Their children were my grandfather, Frederick J. Bootier, Francis X. Bootier and Lawrence Bootier. Lawrence fought in WWI and was never the same after that. He died on 1/25/1964. Francis Bootier was the nicest of the brothers (sorry, grandpa) and helped my father financially through college. Nelson was a tinsmith, Frederick N. was a carpenter and Frederick J was a linotype operator at the Saratogian. My father worked at carpentry before he became a teacher and he remembers working with his grandfather. So the continuity is Nelson (1829-1906), Frederick N(1867-1951), Frederick J (1893-1983), Richard James (1919 -), Susan Bootier Humeston (1956-). Phew. Is that cool or what? Now for some scans of Saratoga Springs and environs. The first one is of an indian. From the info on the back of the photo, his name was evidently Job Shavone, a French Canadian who lived(?) at the Indian Cairn at Highrock Park. I can't find Highrock Park on the internet, except for one by that name in Staten Island. Perhaps that is the one - I have no idea. The photo under the one of Job Shavone (which Ancestry.com shows to be an Italian name - ??) 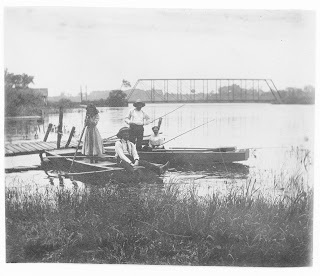 is a picture of some people in boats near Stafford's Bridge at Saratoga Lake. I think the man seated is Albert Freeman, my grandmother's aun'ts husband. And there's 'Freeman's something' which rings a bell too. Freeman's Bridge maybe. Will check into this too!